The Vondelpark is an elongated and also the biggest park in Amsterdam, opened in 1865. Since 1996, the park is a national monument. 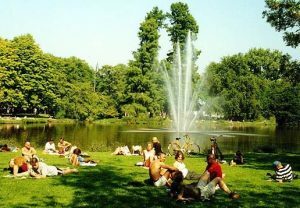 The Vondelpark is the best known and most visited park in Amsterdam. In addition to the locals a lot of tourists also find their way to this park. On average the park has 10 million visitors yearly. The park is located in the Amsterdam South district, on the border with the Amsterdam West district. It extends from the Stadhouderskade to the Amstelveenseweg. This park is a place for many visitors and inhabitants to relaxe and escape the populated city of Amsterdam. In summer you’ll find people taking naps, studying, working out or just enjoy the sunshine. Coming to visit Amsterdam on the famous nationale holiday ‘Kingsday’ (Koningsdag in Dutch) on every 27 April, then going to visting the park is very fun attraction. Many families come here early with their childeren in the moring to sell all their old toys, clothing, videogames and many more second hand items. In the summer months, theater performances and concerts are held in the open-air theater. right next to it, also at the edge of the park is the Vondelpark pavilion, which housed the Filmmuseum from 1972 to March 2012, and has been opened since May 2014 as Vondel CS. There is also the Blauwe Theehuis, in the style of the Nieuwe Bouwen. On the south side of the park is the Vondeltuin, a restaurant with a terrace. There is also a Stayokay hostel and a tennis park. For visiting the center of Amsterdam and the larger Region of Amsterdam you may buy the Amsterdam & Region Travel Ticket for 1-2-3 days.